Flemington is an inner residential suburb 4 km north-west of Melbourne, situated between North Melbourne and Ascot Vale. Its eastern boundary is the Moonee Ponds Creek, with alluvial flats that were flood-prone until recent times, rising to the north-west towards Ascot Vale. To the south-west is the Flemington Racecourse, also situated on low alluvial flats, next to the Maribyrnong River. Flemington's name has either of two possible origins. The more likely is from James Watson who early in 1839 came to Port Phillip as a pastoral agent for English and Scottish investors, as well as investing for himself. He purchased land in Flemington and Heidelberg. His wife was Elisabeth Rose, whose father was manager of the Flemington estate in Scotland. (Watson also named his Heidelberg land Rose-Anna, inspired by his wife's name, and the area later became the suburb of Rosanna.) The other possible origin for the name is thought to be Robert Fleming, who established a butchery on the site later taken by the racecourse. A butchery beside the Saltwater (Maribyrnong) River would have been in keeping with the river's later use for noxious outfalls. Flemington racecourse was first used for horse racing in March 1840. In 1848 the Port Phillip Racing Club took a lease of the racecourse site. The first Government land sales were held in December 1840. Flemington is traversed by Mt Alexander Road, the route to the Bendigo gold diggings. In 1851 the Flemington bridge over the Moonee Ponds Creek was built, improving the connection to the gold diggings' road out of Melbourne. The Flemington Hotel had been there since about 1848. In 1855 the pre-eminent merchant and speculator, Hugh Glass, acquired Watson's property and built Flemington House, in the vicinity of Mt Alexander Road and Mooltan Street. In 1859 the western part of Flemington was taken for a new stockyards, to relieve the congested facility at Elizabeth Street, Melbourne. Two years later abattoirs were opened near the stockyard. The move coincided with the opening of the railway line from North Melbourne to Essendon, which ran near the stockyard at Newmarket, Flemington's commercial centre. A primary school was opened in 1858 in Mt Alexander Road, next to a Wesleyan church, both on land given by Glass. Down at the bridge several industries were established: a bone mill, soap and candle works, and more hotels were opened along Mt Alexander Road and around the stockyards. 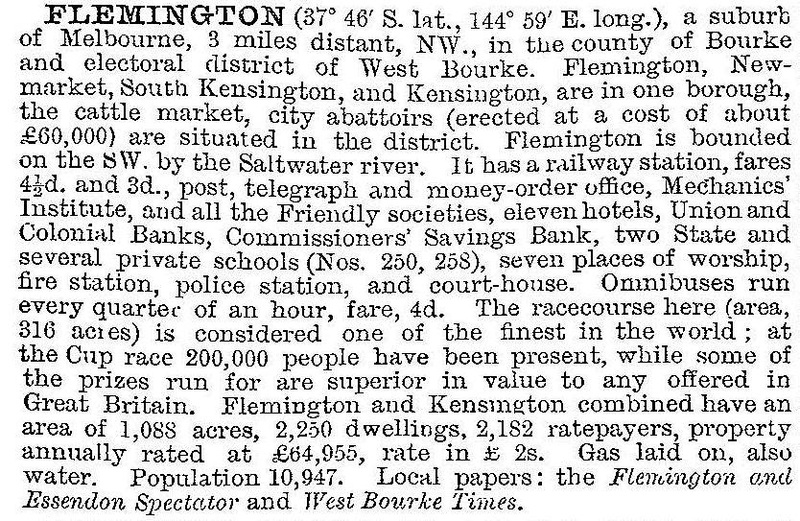 On 25 January 1862 Flemington was incorporated in the Borough of Essendon, an association which lasted until 17 March 1882, when the separate Flemington and Kensington borough was created. In 1876 Flemington's third large industry was opened (after the stockyards and the abattoirs) on low-lying land: Debney's tannery, a source of local employment, gave its name to lower-lying land next to it, Debney's Paddock, later to become a major post-war high-rise housing site. In 1906 tramlines were opened along Mt Alexander Road and Racecourse Road (Newmarket), a year after the borough was united with Melbourne city. (The Melbourne council had taken over the stockyards in 1898.) The borough's town hall in Bellair Street, just off Newmarket, had an independent life of only four years, but it continued to be a social centre for years to come, housing a free library and providing meeting rooms. In 1910 the Glass property was sold, having been vacant for some time. (When Glass died in 1871 his widow had remained on the property.) The owner, John Madden bred horses for export to India, and he renamed the house Travancore, after the Indian state. In 1924 the property was subdivided, creating the Travancore Estate (with Indian street names), and space for the new Flemington primary school. Travancore House (demolished 1947) became a special school, the land down near Debney's tannery became a land-fill tip for thirty years, providing a breeding place for rats and venue for tip-scratching during the Depression years. Occasional floods from the Moonee Ponds Creek still carried in frogs to nearby houses. The land-fill area was partly taken in 1957 for the Debneys Park high-rise flats which were constructed within ten years, adding over 4000 residents to Flemington. A primary school was opened in 1975 (relieving the Flemington primary school), and a high school opened in 1965. A girls' high school opened in 1966, replacing the Domestic Arts School which occupied the original school site in Mt Alexander Road (1858), and subsequently became the Debney Park secondary college. By the 1950s Flemington received influxes of European migrants, the largest group being Italian. St Brendan's church and school, always a landmark, was well attended. The smaller St Stephen's Presbyterian church, with its attractive spire in the post office precinct, at Newmarket, was burnt down in 1970. As the post-war migrant families moved out of the Flemington cottages they were bought by people wanting inner-city living, but at prices which became less affordable as demand strengthened. Travancore, with pre-war art nouveau flats and larger Californian bungalows, had always commanded better prices, and property values moved accordingly. Whereas in 1986 the median house price in Flemington was 87% of the median for metropolitan Melbourne, in 1996 it was 118%. Flemington has open space at its extremities, along the Moonee Ponds Creek and in Debneys Park, and in a corner near the racecourse. There is local shopping in Newmarket, and the most convenient regional centre is at Puckle Street, Moonee Ponds. Flemington remains best known for the racecourse. In years past optimists owned or had a stake in horses hopefully destined for a Melbourne Cup win. The blend of blowflies and air borne manure on a day with a hot northerly seldom disturbs Flemington in the 1990s. The drovers and dogs went when the last muster was held at the stockyard in 1985. In 2014 Flemington primary school had 475 pupils.